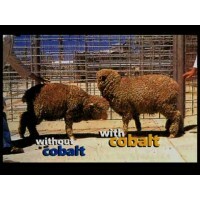 Cobalt is an essential mineral required by sheep and cattle to optimise health and growth. Most UK pastures tend to be low in cobalt or high in manganese which inhibits the uptake of cobalt. In these situations, sheep need to be supplemented with cobalt on a regular basis. Sheep themselves do not really need cobalt but it is the billions of bugs in the rumen that digest the grass for the sheep that need cobalt to manufacture Vitamin B12 which is an essential element for the animal. Vitamin B12 is used to metabolise propionate for energy and for making sulphur containing amino acids for wool growth. If cobalt is not supplemented on a regular basis then lamb vigour will be compromised and in severe cases the lambs will show signs of ‘pine’, the term for cobalt deficiency. Deficiency becomes more apparent as young animals get less milk and become more ruminant. What are the symptoms of Cobalt Deficiency? The wool will dry out, the fleece becomes open, tears staining of the face can be seen and in extreme cases the lamb will die if not treated. Most sheep farmers will be aware of cobalt deficiencies on their holdings but if you are unsure, forage and blood samples should be sent for to the lab. As cobalt is not stored in the body to any great extent, it is essential that lambs are regularly supplemented with cobalt. We highly recommend oral drenching, which is convenient in lambs (e.g. Ovi-Power), and/or bolusing in adult sheep, young lambs, weaned lambs and cattle (e.g Cobalt Guard with Copper , Cobalt Guard , Cobalt Master , Tracesure, Cosecure, CoseIcure). We can tailor-make a mineral plan for your farm, so that your stock are adequately supplemented at the right cost. This is what we call the "COBALTcomplete" System. A few questions and maybe some forage analysis helps build the plan. You can save money on mineral blocks and any "random supplements." Cattle can be drenched (e.g. with Bovi-Power) at key times to give a boost above what may be available in the diet. Cattle show less specific signs, but will not thrive if short of cobalt, due to poor energy production in the animal. For more information, please check out our ‘Sheep Health Information’ and ‘Cow Health Problems’ pages. Alternatively, for expert veterinary advice please call G Shepherd Animal Health on 01772 690131.